However, before all hope was lost the remnants of mankind came into possession of alien artifacts that would allow it to launch one last desperate assault. At this point, the enemy forces were already at the doorstep of EDC headquarters, and Earth was bound to fall… With limited recourse left, they came up with the final plan; attack the enemy headquarters with all they have. With help from “Dr. AKEMI” the plan was to destroy the central core of the alien base. It’s Dangerous to Go Alone – The alien forces are an overwhelming force, but one you don’t have to face alone. Bring along three friends and face the alien hordes with local co-op play! 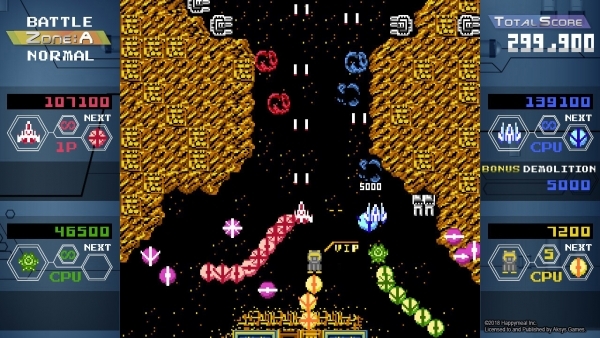 It’s not Retro, it’s Timeless – With 8-bit graphics and a focus on pure arcade shooting action, Quad Fighter K harkens back to the times when it was all about you (and perhaps a couple of friends), a quarter, and lightning-fast reflexes. Quad Fighter Powers, ACTIVATE! – Do your best work solo, or unleash real damage by linking your ship with a teammate to crush your foes and save the planet. Unlock different attacks by connecting your ship with your allies. Should I Stay or Should I Go? – Whether you’re gaming at home or on the run, thanks to the mighty morphing powers of the Nintendo Switch, you can take out the alien hordes threatening our alternate Earth whenever, wherever.